European Union foreign ministers have unveiled tough measures to prevent terrorist attacks, following the Madrid bombings that killed 202 people. In a draft declaration after talks in Brussels, they urged EU states to mobilise all their resources, including military ones, to deal with the threat. The draft warns that countries outside the EU risk losing financial support if they do not do enough to fight terror. 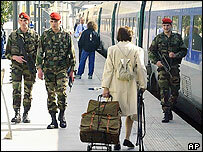 It says counter-terrorism will be a key element of the EU's political dialogue. The ministers also backed the proposed creation of a new EU anti-terrorism co-ordinator. A declaration is due to be approved by EU leaders at a two-day summit in Brussels that begins on Thursday. The Brussels draft was based on the work done by EU interior ministers who met last week. It sent a clear warning to partner countries that their relations with the economically powerful bloc would suffer if they failed to co-operate in the fight against terrorism, analysts say. They say the warning marks a major shift for the Europeans, who until now have been reluctant to use trade and aid as a lever to encourage other states to do more to tackle the threat of terrorism. The document also committed all member states to providing military and other assistance to fellow EU countries in the aftermath of any attack. French Foreign Minister Dominique de Villepin said terrorism was "a menace that affects us all", stressing that there could be "no compromise" on the issue. But the EU knows it also needs to put its own house in order, the BBC's Chris Morris in Brussels says. He says several member states have still not approved measures which were introduced in the aftermath of the 11 September attacks, such as a European arrest warrant. Progress towards harmonising extradition laws or minimum sentences for terrorist offences has also been slow. "What we need is action," said UK Foreign Minister Jack Straw. "The problem of the European Union is that we can only go at the pace of the slowest. Therefore, there is a special responsibility on the countries which have failed so far implementing measures to get moving," Mr Straw said. The ministers agreed to set a deadline of 30 June to pass all laws which had previously been agreed.